More than 190 nations at international climate talks in Lima, Peru, continued Dec. 10 to work on overcoming a serious rift over the aid richer nations are to give to developing nations under a 2015 global climate deal (again). The U.S. and other rich nations pledged $100 billion-a-year in climate aid to poor countries beginning in 2020. There is also a question about how individual countries should provide more detail on any climate aid they are considering when they prepare formal emissions-reduction pledges that will anchor the global climate accord to be signed a year from now in Paris. Industrial nations first pledged the $100 billion-a-year aid at the 2009 Copenhagen climate summit and soon after set up a new Green Climate Fund (GCF). Pledges to the GCF hit what many heralded as a significant $10 billion threshold during the United Nations negotiations in the Peruvian capital, with pledges announced Dec. 9 from Belgium ($60 million) and Australia ($165 million). The 2015 deal to be finalized in Paris would commit developed and developing nations alike to actions to address greenhouse gas emissions beginning in 2020. The underlying rationale for providing the climate aid is that developing nations are far more likely to take on actions and sign on to the global climate deal if industrialized nations help them prepare for rising sea levels and other climate impacts caused largely by the emissions of developed nations. The late-2015 Paris accord, if agreed to, would be the first truly global climate accord to cut greenhouse gas emissions and slow the rise in global temperatures. But there are other disputes over climate finance, including whether only the U.S., the European Union, and other industrialized economies should be ponying up such funds given that many rapidly developing nations are now major emitters. Tuesday, December 9, Green 2.0 will convene a public briefing for media and stakeholders on the steps mainstream environmental organizations can take to increase diversity in the highest levels. Speakers will discuss the challenges that make bridging the diversity gap more urgent than ever, and what some are doing to solve it. The State of Diversity in Environmental Organizations report released by Green 2.0 garnered much press and support this past summer. The report found that although people of color now account for more than a third of the U.S. population, they have not, on average, broken the 16 percent “green ceiling” in mainstream environmental organizations, with the numbers being worse at the leadership levels. On the heels of this report, Green 2.0 launched a groundbreaking partnership with GuideStar and D5, a first-of-its-kind effort to collect and make transparent diversity data from NGOs and foundations in a standardized way. Many environmental nonprofit and foundation leaders have already voiced support for this effort to help the sector to track whether progress is being made. Mainstream NGOs, Foundations & Government Agencies"
For more information or to RSVP please contact Beth Lynk at blynk@rabengroup.com or 202-223-2848. In the report, EBONY identifies statistics related to race in the areas of economic disparity, education, entrepreneurship, health and well being, and protection under the law. 5. Under New York City’s Stop and Frisk practice, 14,549 (53 percent) Blacks were detained versus only 3,363 (12 percent) Whites. However, EBONY not only reports the statistics, but also offers solutions from experts such as Dr. Steve Perry, Dr. Henry Louis Gates Jr., Wes Moore and Attorney Paula Penn-Nabrit. To supplement the feature, EBONY.com is featuring five videos on race relations interviews with thought-leaders including Dr. Ben Carson, Dr. Marc Lamont Hill, Melissa Harris Perry, Rev. Al Sharpton, Julian Bond, Dr. Cornell West, Marian Wright Edelman, Don Lemon, Julian Bond, and many others. Readers can read the remaining results in the December issue of EBONY magazine, on newsstands now. EBONY is the No. 1 national consumer lifestyle magazine targeting the African-American community. As the longest-running Black publication, EBONY has the largest reach in the African-American print space, reaching nearly 20 million readers annually. EBONY features the best thinkers, trendsetters, celebrities and next-generation leaders of African-Americans. EBONY ignites conversation, promotes empowerment and celebrates aspiration. Available nationwide on newsstands and on all digital platforms, EBONY is the heart, soul and pulse of African-Americans. EBONY Magazine unveiled its annual EBONY Power 100 list, which salutes the remarkable achievements of African-Americans in 2014. Among the game changers honored this year are NBA player LeBron James, Sam’s Club CEO Rosalind Brewer, television producer Shonda Rhimes, music producer Pharrell Williams, actresses Audra McDonald, Gabrielle Union and Laverne Cox, comedian Kevin Hart, ballerina Misty Copeland and Bishop T.D. Jakes. Quincy Jones –composer, record producer, artist, film producer, arranger, conductor, instrumentalist, TV producer, record company executive, magazine founder, multi-media entrepreneur and humanitarian –will receive the EBONY Achievement Award. The gala celebration will take place in Los Angeles on November 19, at the AVALON Hollywood. 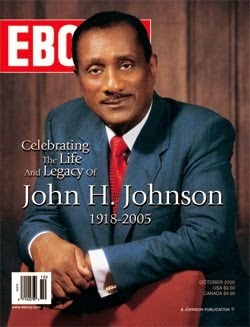 The EBONY editorial team selected the 100 most influential African-Americans in the country. These achievers have made noteworthy accomplishments over the past year. The list of outstanding leaders highlights individuals from a variety of fields, including business, medicine, sports, media, religion, the creative arts and more. As the curator of the African-American experience, EBONY is proud to showcase these individuals. These leaders are honored and recognized for changing the course of history and making an enduring and lasting impact in their communities and the world. The 2014 Power 100 list will appear in the December issue of EBONY, on newsstands the week of November 10. The full list of the EBONY Power 100 can also be found at EBONY.com here. The December EBONY is also dedicated to the topic of race. The publication looks at race relations in America today, and provides an opinion on why race still matters. To supplement the feature, EBONY.com will also feature five videos on race relations interviews with thought-leaders including Dr. Ben Carson, Marc Lamont Hill, Melissa Harris Perry, Al Sharpton, Julian Bond, Dr. Cornell West, Marian Wright Edelman, Dr. Steve Perry and many others. Astrophysicist, author, and science communicator. Emory University's new dean of Goizueta Business School, making her the first African American female to hold that position in the school’s history. President of the American Bar Association. The first woman of color to lead the nation’s most influential lawyer’s group. Journalist & blogger of 1# destination for multicultural fashion. President & Director-Counsel of the NAACP Legal Defense & Educational Fund, Inc.
Commissioner at the Federal Communications Commission since she was nominated by President Barack Obama on June 25, 2009, and sworn in on August 3, 2009. Record producer, rapper & entrepreneur. founder & current CEO of Aftermath Entertainment & Beats Electronics. On April 14th, 230 School girls were kidnapped from the Chibok Government Secondary School by Boko Haram Terrorists in Nigeria. All 230 are still missing.